Our deal of the day selections take the very freshest flowers which have normally been delivered that day. Because you are selecting a style and then allowing our floral designers 'carte blanche' on the exact design, we don't have to follow a menu, and thus, we use those flowers that provide the biggest impression for the money. 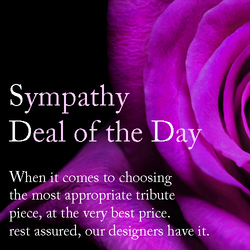 In Sympathy work, the very best designs will always emanate from a 'Deal of the Day' selection due to the normally large style of the work - thus, a deal of the day product will always provide an economical substitute to those designs that feature a very specific look and floral inventory. Casket Spray, Standing Spray, Wreath on a Stand, Sympathy Basket, Arrangement for the home.